Maurice Mog Ahearne - drums, replaced 1966 by ??? Greenbeats promotional postcard showing the later, augmented/showband lineup. 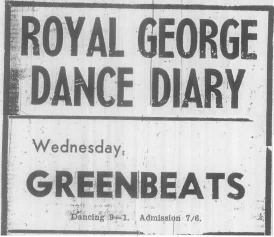 The Greenbeats began as The Caravelles formed in Dun Laoghaire in 1960. They were led by John Keogh, a fine showman and an excellent rock & roll pianist often compared to Jerry Lee Lewis. There were some lineup changes in 1961: Ted Carroll switched from bass to management, marking the beginning of a long career in band management (Thin Lizzy, etc) and later record label management (Chiswick Records). His place was taken by Brian Lynch; Des Bonner left for Sweden; and Ken Healy was replaced by Maurice 'Mog' Aherne. 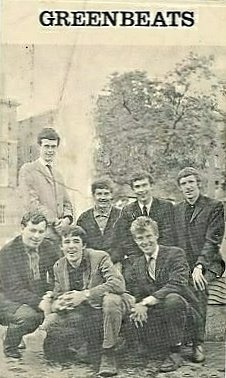 This lineup went on to become one of Dublin's top beat groups of the 1960s. Two of guitarist Paul Williams's brothers were also in bands at the time, Pete Williams in The Kult and Rodney Williams in Rootzgroop. The Caravelles ruled the Dublin scene from 1962-65. They had a large repertoire of songs including Little Richard, Chuck Berry, Ray Charles, James Brown and Roy Orbison as well as the Stones, Beatles and Searchers among many others. In 1963 they made their TV debut on RTE's Curtain Up variety show. In September the same year they provided backing for the Springfields on their '63 Tour of Ireland. 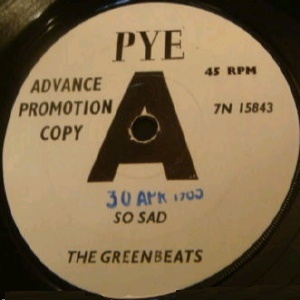 They changed their name to The Greenbeats when they played Liverpool's Cavern Club in April 1964 to avoid confusion with another band. 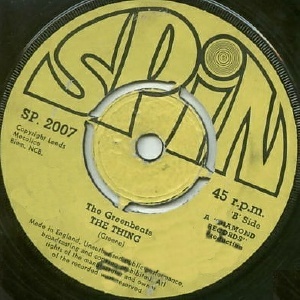 The Greenbeats were a sensation in Ireland in the mid-1960s thanks to a regular beat group slot on RTE TV's weekly The Showband Show during 1964-65. They were the nearest thing to an Irish Beatles. Alas, no video of this show survives. The band also had their own radio show on Radio Eireann (RTE) called Not So Green, which was a forerunner of a Monkees style TV show. It was based around the fictitious exploits of a pop group. Brian Lynch returned to his studies in early 1965 and was replaced by Peter Barden. 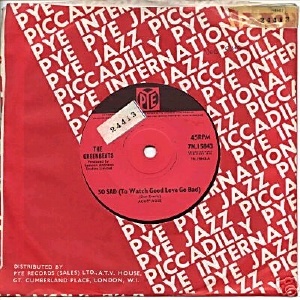 The rise of the beats groups, however minor in retrospect, threatened the showbands hold on the public's affections (and wallets) and there was an attempt to smear the beat scene with bad publicity in the mid-60s. 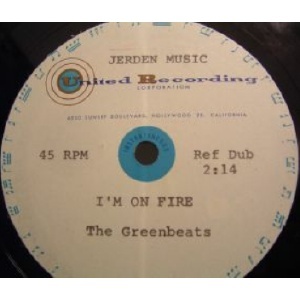 The Greenbeats were almost a victim of this when their slot on The Showband Show was cancelled by RTE as a result of these smears in 1965, only for it to be reinstated following public outcry. Ironically by September 1965 the band had decided to opt for an augmented lineup (i.e. with horns) and to tour the showband circuit. 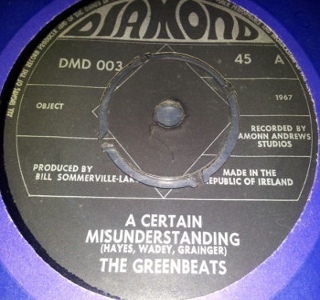 They contined to be very popular in Ireland for a number of years but their beat credentials were somewhat tarnished. This may have been why Mog Aherne left in 1966. He was later in Aesop's Fables and the Never Greens. 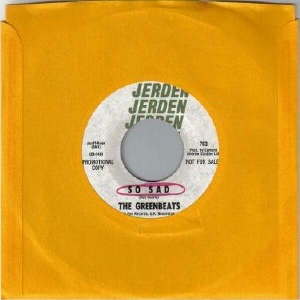 The Greenbeats recorded six singles during their lifetime. The first three released during 1964-65 belong to the beat era. 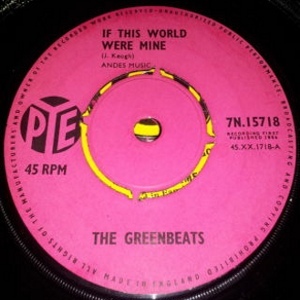 The second A-side "If This World Were Mine" is mediocre but the B-side is a good version of an early Jagger/Richards composition "You Must Be The One". Both sides were produced by John Paul Jones which adds to the singles collectability nowadays. 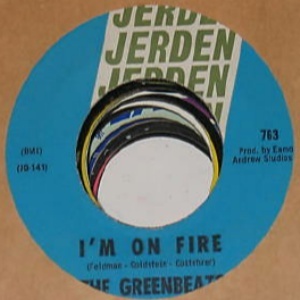 It was released on Pye in Ireland and the UK and Jerden -- with the sides reversed -- in the USA. 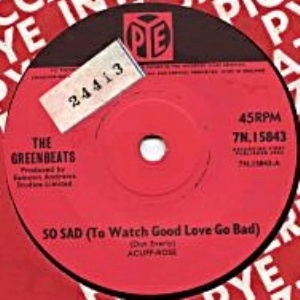 The third single "So Sad (To Watch Good Love Go Bad)" is also well worth tracking down. 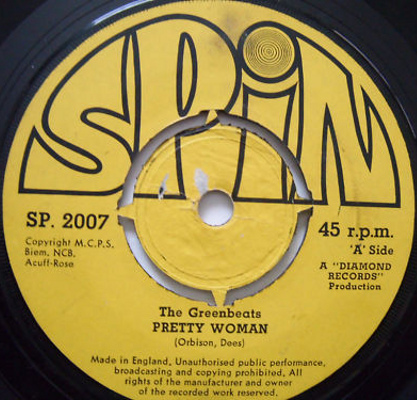 It was two years before the bands fourth single, a cover of "Pretty Woman", emerged in 1967 by which time The Greenbeats had entered their showband phase. 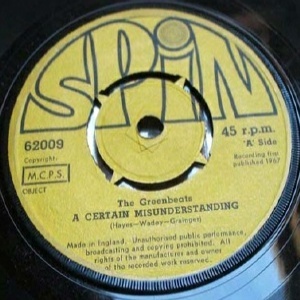 This and the fifth single "A Certain Misunderstanding" were issued domestically on the bands own Diamond Records label, launched in 1967. 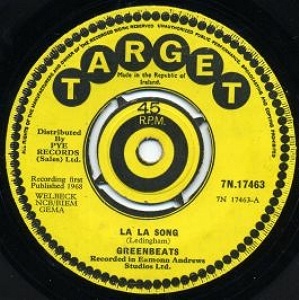 Their sixth and final single was a cover of Jon Ledingham's "La La Song", released on Target in 1968. Before that final single, Paul Williams was killed in a car crash outside Limerick, on 22 November 1967. Keith Donald (sax) was injured in the same accident. Bobby Kelly (ex The Hootenannys, later in Chosen Few, Stepaside and The Sands) was his replacement. John Keogh left for full-time employment at RTE as a sound engineer in June 1968, where he'd already been working as an effects operator (i.e he played the actual records which the announcer introduced). 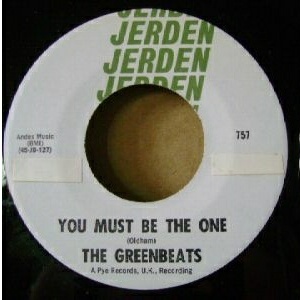 The Greenbeats split a couple of months later in August '68. Most of The Greenbeats assembled again for one off recordings for RTE (often for Brendan Balfe) over the next few years. They recorded a jingle announcing two new pop shows on RTE featuring Larry Gogan and Brendan Balfe. They also provided musical backing on Brendan Balfe's "Bothered And Bewildered" (Hawk Records) comedy LP in 1975. Though he'd quit performing to work for RTE, John Keogh was still involved in the music scene. He recorded a solo LP in the 70s titled "Bread 'N Butter", which mixes soul, R&B and 50s Rock'n'Roll covers in a Glen Campbell/Jimmy Webb/Neil Diamond kind of way. He was also involved in a single released in 1974 under the name The Light Blues to celebrate Dublin's appearance in the 1974 All-Ireland: "Heffo's Army" / "The Dubs Are Back" (Hawk Records HASP 351); and he wrote the "Stop, Think" for the North Western Health Board's anti-drink driving campaign in 1979, which was recorded by Kim Newport and released as a single. In the late '70s, John Keogh formed Full Circle. 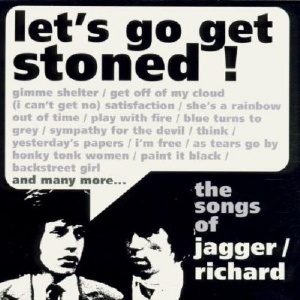 A-side by J.Keogh, B-side by Jagger/Richards. Produced by John Paul Jones. LP - Puck Records - PK 2 - IRL - 197? Notes: Comedy/satirical LP with musical backing by John Keogh (piano), Benny Cheevers (guitar), Damien Fannan (bass) and Mog Ahern (drums). • v/a - Let's Go Get Stoned!